It's hard to believe that an environment so perfect for walking could lie so close to urban sprawl. But the Sidlaw Hills, a few miles to the north of Dundee, have long been a popular retreat for city dwellers looking to stretch their legs. 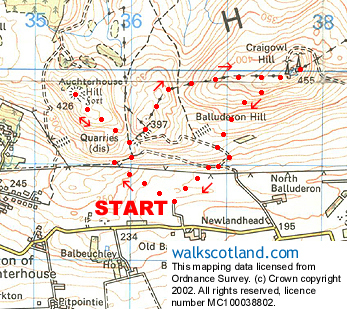 This route rises from the Balkello Community Woodland on to Auchterhouse Hill, before hopping over neighbouring Balluderon Hill to the familiar landmark that is Craigowl Hill. A public car park serving the woodland is a convenient starting point. On the northern edge of this, a gate leads to an information board with details of a short nature trail laid out amid the young trees. The walk follows this in part. Bear left and follow a grassy track which skirts along the top edge of an area of open grass. This rises gently to pass through a gap in a neat stone wall. A few yards on, the way reaches a junction. Turn right here and the path rises more steeply, passing under a line of overhead electricity pylons to reach the top edge of the plantation. Turn right here to join a more established track, then turn left and follow this up to a picnic table below old quarry workings. A path rises from here to reach a gate. To make the short detour to the summit of Auchterhouse Hill, go through the gate and turn right. A wide path rises through bracken and heather to the top, the site of an ancient hill fort. Retrace your steps from here to the gate, go through again then follow a path which heads north, following the fence up to the col between Auchterhouse Hill and Balluderon Hill. At the highest point of the pass, a path branches off on the right, climbing steeply at first before flattening off to reach a cairn and indicator on the top. This was recently created as a tribute to Syd Scroggie, one of Scotland's most remarkable mountain men. Syd, now in his 80s and living in the shadow of the Sidlaws, has long pursued a passion for the great outdoors, despite losing his sight and part of his leg during the Second World War. The cairn, complete with view indicator, guides the eye to mountain landmarks including the Lomond Hills in Fife, Lochnagar, Glas Maol and Mayar, above Glen Clova. The vistas from Balluderon Hill are magnificent. To the south, uninterrupted views stretch over Dundee and the Tay Estuary to the Kingdom of Fife beyond. The next port of call on this route - neighbouring Craigowl Hill - is clearly seen to the east. This peak is easily identifiable by the jumble of masts adorning its summit. A narrow path strikes north through the heather from the cairn, meeting up with the boundary fence. It curves right and dips steeply into a narrow glen below. At the bottom, a stile is crossed before the path rises, a strenuous climb leading up past a lone tree to another stile just below the compound of communications equipment. Cross this and, a short distance on, a cairn is reached. There's a trig-point sandwiched between two fenced enclosures a few yards away. To begin the descent, re-cross the stile just below the summit and a path bears left, dropping across the southern slope of Craigowl Hill. It descends through hill grazing country to reach a stile at the bottom. Cross to join a substantial track and turn left, following this as it curves right through a tight hairpin bend. At the next hairpin below, leave the track on the right and follow a grassy path leading down and back into the community woodland. At the bottom, turn left and the route rises gently over a wide grassy gap in the trees, bearing right through saplings to the car park. Grading A short walk with some fairly strenuous sections of ascent. Sheep and cattle grazing, so dogs will need to go on the lead in places.